While it may seem like this is giant creature month (with the release of RahXephon, a column about the re-release of Evangelion, and a feature on Argentosoma), Neo Ranga differs in many ways from the series it will inevitably be compared with. Sure, it begins like many other series, with Ranga -- a manifestation of a little known god from a small island near Japan -- crashing through modern-day Tokyo. As usual, the conventional weapons the Japanese Self Defense Force used against the gargantuan creature have as much effect as peas tossed at an elephant, so something else must be found to stop its stroll through Shibuya Station. Rather than employ the use of giant human-controlled Evas or send a beast similar to it to fight it (as in Argentosoma), it merely takes the command of three sisters to bring it to a stop. As it turns out, the Shimabari sisters are the heirs to Barou Island -- the home of Ranga. However, they've lived their entire lives in Tokyo, and when they hear of their high status in the primitive nation, it doesn't make much of an impression on them. They didn't have much to do with the culture of Barou at all, until Ranga decided to pay them a visit in Tokyo. This series was produced by Pony Cannon and Studio Pierrot, and the show's quality seems higher than average. The city backgrounds do an excellent job of depicting the Tokyo area, but watercolors are used frequently, lending an organic look to most of the settings. Explosions occur often, and while the story appears simple at first, there's ample room for intrigue. The music is an engaging mix of tribal chanting, simple woodwinds, and symphonic melodies. Something that sets Neo Ranga apart from other series is the short 15 minute running time of each episode, like Steel Angel Kurumi. Even though the episodes are brief, they still feel cinematic in their presentation. More than anything, Neo Ranga is about change. For the Shimabari sisters, life wasn't very different after they discovered they ruled an island. Yet, when change comes in the form of a building-tall ancient god strolling through downtown Tokyo, they have no choice but to adapt to their new lives. In the series, people react to Ranga's arrival in many different ways. At first, almost everyone fears it. The JSDF's violent response to Ranga shows how mankind usually treats something unusual: they perceive it as a threat and attempt to blast it to bits. 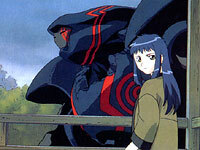 After the general public learns of Ranga's connection to the Shimabari sisters, however, the fear and hatred of Ranga melt into general annoyance at the destructive force. Soon enough, the neighborhood begins to accept Ranga for what he is, which indicates that the writers are at least a little optimistic about the human race. Neo Ranga preaches acceptance of others -- no matter how different those others may be. It reminds its viewers that our lives change constantly and without notice, and that the first step towards a contented life involves accepting that fact. There are some nice visuals here, as well as interesting characters, good music, and a nice job of packaging the show thanks to ADV. 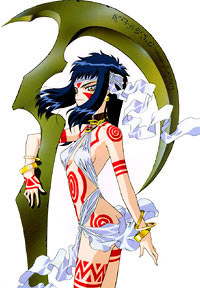 However, the main draw for Neo Ranga is the moral of tolerance that runs throughout the series. Sure, it's a little bit exaggerated and simplified, but it is nonetheless a valid point. The first volume of the series was just released by ADV Films, and it's available by itself or with a pretty collector's box. There are eight 15 minute episodes on the first disc and plenty of extras, so if you're looking for a "giant robot" show that takes things in a slightly different direction, then you might do well to give Neo Ranga a shot.